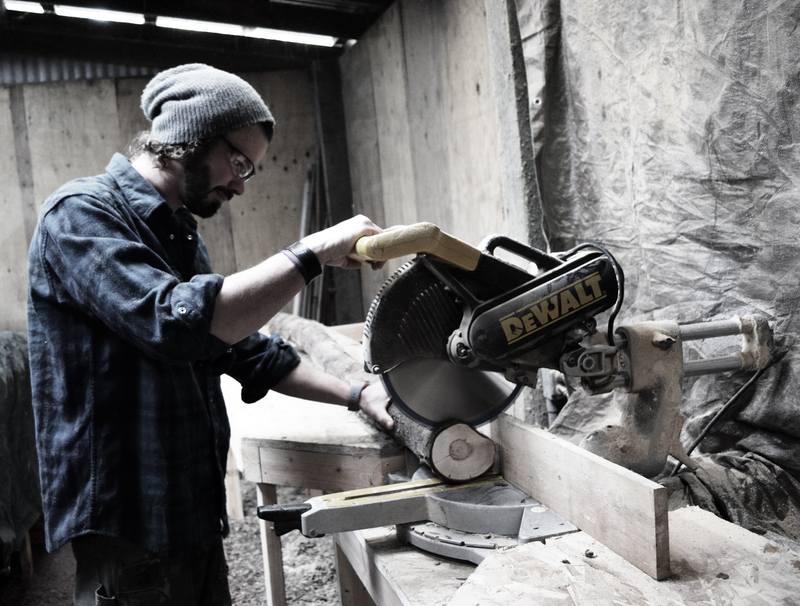 I’m very excited to introduce you all to Ben and Nicole who work with wood for this installment of Material Obsession. 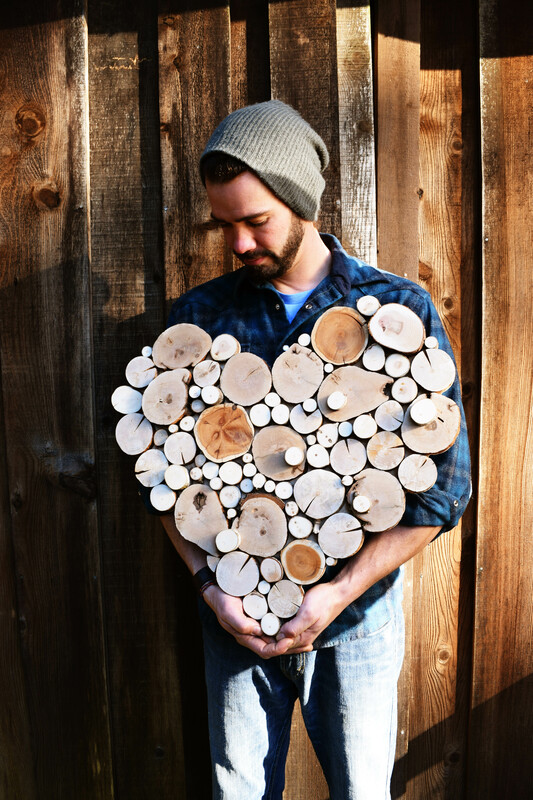 I too LOVE wood as an art and craft element – my dad is a wood worker by trade, it might be in my DNA or something. I love the way wood smell, in particular. There are so many varieties of wood – different colors, strengths, and characteristics – and it is such a pure material with so much history. I love the idea of rescuing wood that would otherwise be discarded or ruined, and giving it new life in the form of art. Our creative process varies from piece to piece. Sometimes we are trying to create the feeling of movement, other times we base a piece around a particular slice or branch of wood that speaks to us – other times we simply use the tree slices as a backdrop for an inspirational saying/quote. In all the pieces we try to capture a free form shape and express a warm earth based feeling. The actual product is created with slices cut from branches or trees that have been discarded by others or fallen naturally in the forest. These slices can vary in thickness from 1/2 inch to 2 1/2 inches thick which gives the sculptures depth. 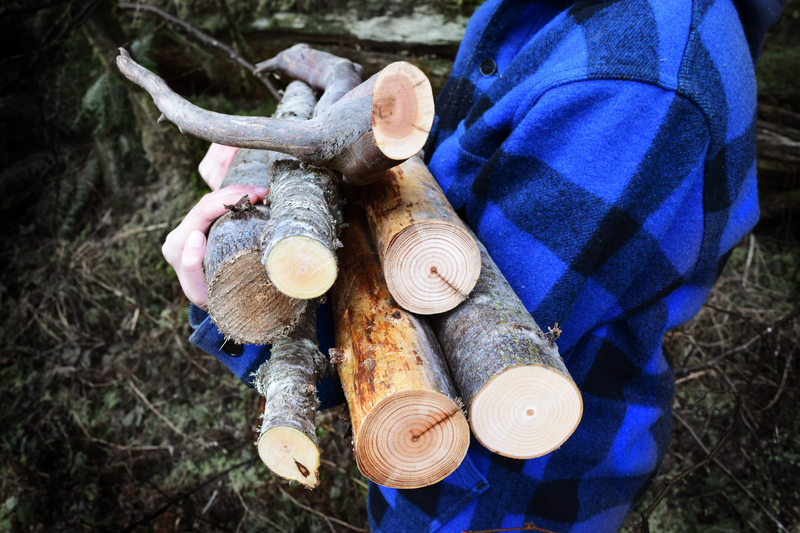 We also will sometimes incorporate branches and driftwood in their original form among the slices. We love using something that would ordinarily be left to rot or be burned and turning into a new and unique piece of art. Having a new perspective on simple materials is why we love making the work we do. We both take part in all aspects of creating each piece from the design to the finished product. One of the things we greatly enjoy about this type of art is that is lends itself to custom pieces which we can create by working with a client. Even though we can create custom art for specific clients, this medium keeps it wild and organic character comes about because every slice is unique! this medium keeps it wild and organic character comes about because every slice is unique! Isn’t this awesome?! I love that each piece is SO unique because each bit of wood is one of a kind. I have a very soft spot for one of a kind work, and wood, like I said. Thank you Ben and Nicole for sharing your Material Love with us! Please visit Ben and Nicole on Etsy and Facebook and support your fellow artisans. P.S. Submit your material obsession to be featured.